One of the most responsible areas is operative control after grain-growing treatment. 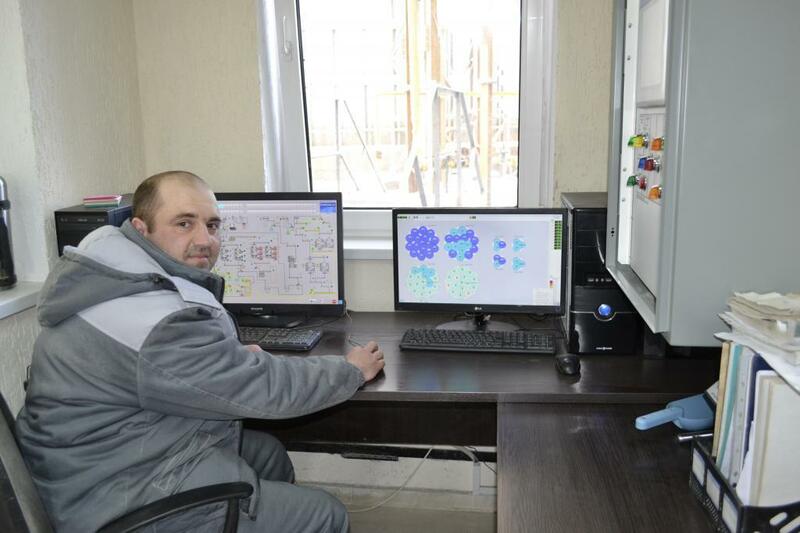 This process is managed by main engineer Alexander Knyazev and main technologist Elena Kushch. Treatment of grain-crops is laid on hardware workers: Mikhail Dobruy, Sergey Marchenko, Igor Zubar, Valery Molotokas/. -Management by grain dryers and other equipment are produced from an operator room, where a control stand is located - workplace of hardware worker. Here on the computer monitors all working processes requiring permanent control are represented, and in case of necessity are adjustmented. Operator mainly influences the successful completion of productive processes, quality of products - Alexander Knyazev explains. According to the chief executive of LTD "Shostka Elevator" Vladimir Kokotin, the collective of enterprise is aimed at a result - high quality of the produced products - and works systematically on the tasks.